Its with no doubt that trend show host Larry Madowo is one of the most celebrated men media personalities in the country, Not only because of his looks but also for his talent and love for the job he does. The ever laughing larry gained popularity in his show the Trend and also known for his intelligence and tough interviewer. 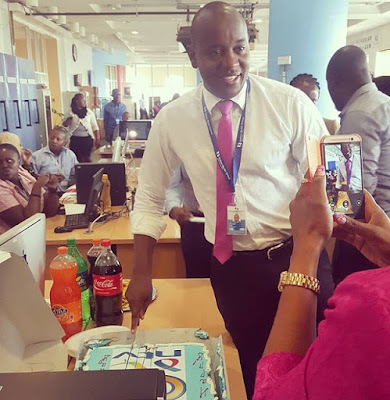 On Wednesday NTV employees led by the Trend show Host Larry decided to give their boss Linus Kaikai a big surprise that he did not expect. Mr Kaikai was offered a memorable birthday cake with the company’s logo to mark the once-a-year occasion. Later larry took to social media and shared some of the photos with his funs.